Dice por ahí una frase popular en México que "dios los hace y ellos se juntan". Esta frase podría aplicarse a la perfección con una buena cantidad de amigos a los que he tenido la oportunidad de conocer, y los cuales resultan tener gustos similares a los mios y un tanto diferentes a los de la mayoría de la gente, ya sea música, ropa, cine, fotografía, etc. Esto me pasó hace poco con una chica llamada Maricarmen, que mientras platicabamos y empezamos a hablar de algunos ilustradores resultó que sus gustos eran muy similares a los mios... y esa ocasión ella me mostró unas imágenes de un ilustrador al que ya conocía pero que tenía olvidado entre tantas carpetas de imágenes... y es nada menos que Ray Caesar. 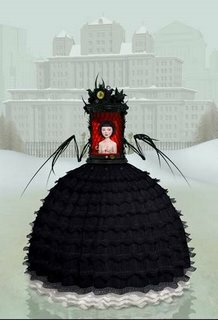 Ray Caesar es un artista visual de origen londinense cuyo trabajo ha sido exhibido en una gran cantidad de exposiciones a nivel internacional, así como publicaciones como la revista Yuxtapoz que se especializa en mostar el trabajo de ilustradores con ciertos tines un tanto oscuros en su trabajo. 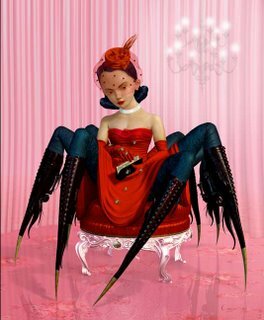 Incluso podría encontrarle un pequeño parecido con el trabajo de Mark Ryden, a diferencia que el trabajo de Ray Caesar no se ve tan influenciado por íconos de la cultura pop como en el caso de Mark Ryden. A popular phrase in Mexico says: "God does and they join themselves". This phrase could be applied perfectly with a lot of good friends who I had the opportunity to know, and which have tastes similar to the mine and different from most of people like music, clothes, cinema, photo, etc. This happened to me recently when I know a girl called Maricarmen, while we were talking about some illustrators I realize that their tastes were very similar to the mine... and that time she showed me images of an illustrator who Im already knew but it was forgotten between so many computer image folders... he is Ray Caesar. Ray Caesar is a visual artist of London, his work has been exhibited in a great amount of places, and in a lot of international magazines like the Yuxtapoz Magazine that specializes in show the work of illustrators with a dark taste in its work. 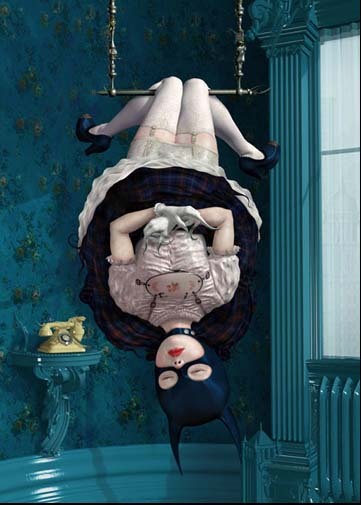 The work of Ray remember me a bit of the work of Mark Ryden, the difference between they is that the work of Ray Caesar is not been so influenced by ícons of the pop culture as the Ryden´s work. I recommend you to visit his website where you can find a section very interesting in where it explains us the process that he follows in the creation of his works and also I recommend to them to check his biography, where we can see a little of the black humour of Ray in the history and the photos of his childhood. And I soon hope to be able to obtain the interview with Ray where he himself explains us more of the creative process of his works. Publicadas por m.o.s.t.r.i.t.o. a la/s 12:31 p. m.
Es muy bueno !! aqui en España salieron trabajo suyos en una revissta de Photoshop!